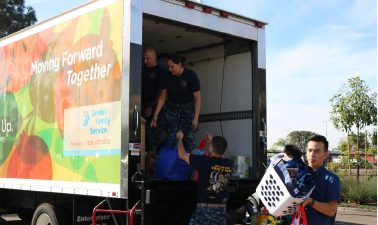 Help community members get back on their feet by providing emergency food assistance and other resources. Assist individuals as they shop for their own groceries, answer questions about the shopping process, provide information on healthy provide choices, and check out groceries. Assist with food prep and cleanup in the Loonin Family Kitchen, which helps maintain good health and maximizes independence for older adults. 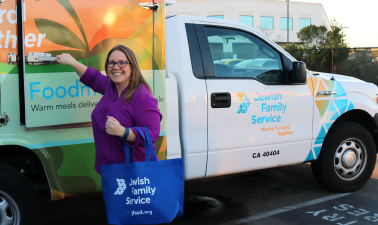 Deliver warm meals and a warm smile to homebound older adults and younger disabled adults with the JFS Foodmobile, which has delivered warm kosher meals to San Diego’s homebound older adults and younger disabled adults for over 40 years. Help build a community of support for Safe Parking Program clients. Provide a meal and/or activity to people experiencing homelessness. Serve lunch to older adults at our two Social & Wellness Centers – the College Avenue Center and Balboa Avenue Older Adult Center. 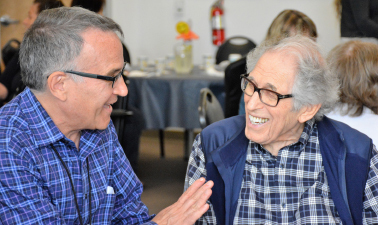 Congregant meals offer a daily opportunity for older adults to connect, socialize, and exchange stories and smiles. Celebrate a bar or bat mitzvah, birthday, wedding, anniversary, or other milestone by encouraging friends to give to JFS. Helping San Diegans age with dignity is one of our main priorities. Services for older adults include Fix It home repair, Foodmobile meal delivery, On the Go transportation, Friendly Visits, and Geriatric Case Management. With volunteer-driven programs like Jewish Big Pals, JFS fosters meaningful ways for members of the Jewish community to live out our shared value of Tikkun Olam (repairing the world) in service to each other and the greater San Diego community.